Hi, sorry about a delay in posts but I have been so busy this last 2 weeks with the fairs, getting last minute orders out and prearing for my wonderful new pet's arrival. We've named him Andre and he arrived on Sunday, having travelled from Hartlepool in the snow! (Well not actually in the snow, he was snuggled up in his box). 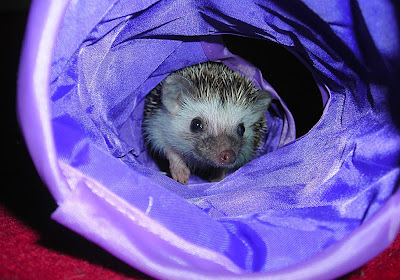 He seems to be settling in quite well and in between sleeping is coming out for cuddles :o) Here's a picture of him in his play tunnel, he's coming up to 7 weeks old. He looks adorable, I look forward to seeing more photos as he grows up! Oh my! He is so sweet and what a great name too! I hope you and Mark (and Andre! )have a fab Christmas! Yeah, he's so gorgeous, and very cheeky! He's doing really well, he seems to eat everything I give him... even his greens!